Call Center Plus offers a variety of pricing options to meet your individual needs. Your fees are billed in real time and rounded to the nearest second, not minute. There is no contract required for signing up with us. Why? Because we are sure you will be pleased with our services and will want to stay with us for years! If you expect a low call volume, don’t know how many calls to expect, or simply just don’t want to be tied down to anything that feels like a contract, then you can choose the plan where you will only be billed for the minutes you use. Nothing more, nothing less! If you know you will have a high call volume and want the best price per minute, you may want to consider our high-volume package where you buy a specified number of minutes per billing cycle. We charge a one-time set-up fee of $40.00 per hour (most accounts can be set up in one hour or less). If you need an 800 number from us, add $0.10 to above prices and $10.00 per billing cycle. If you choose to pay by credit card, we charge a processing fee of $0.35 per transaction plus 3% of total invoice. If you choose to pay by check, we reserve the right to charge your card if payment is past due (see Service Agreement at end of document). Special projects by bid only. Includes inbound email monitoring, customer service special projects, inbound sales, etc. Please note: Final bid price for special projects cannot be determined until after this set up form has been reviewed! 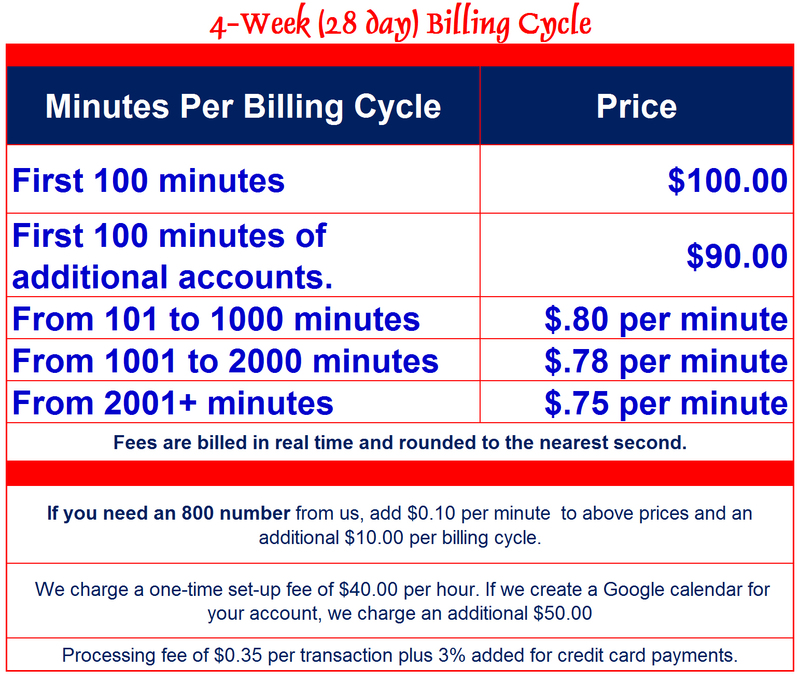 If we create a Google calendar for your account, we add an additional $50.00 to the set-up fee charges. Please see Service Agreement at end of document for holiday charges. 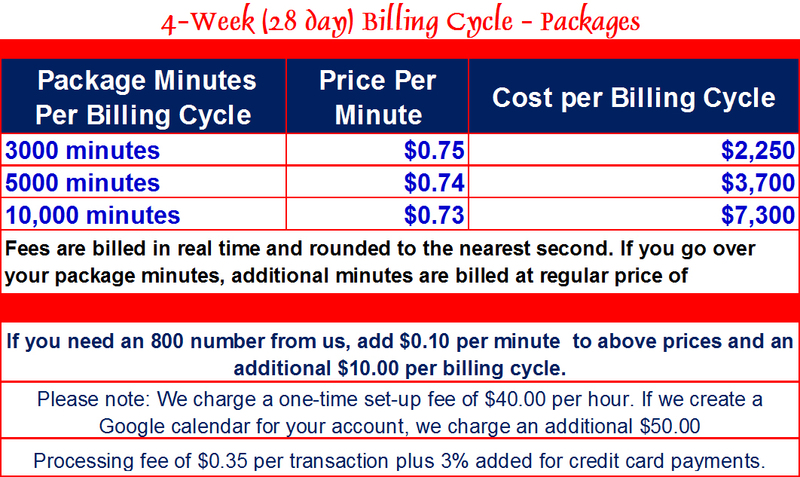 For each 4 week (28 day) billing cycle, you pay $250.00 for 75 calls. For all calls over 75, we bill $1.75 per call. At Call Center Plus we take pride in being able to set up your account to meet your specific needs. We understand that no two businesses are the same, even when you are providing similar products or services. We are incredibly versatile! When we take your calls we can email the information to you, send you a text message, send a fax, and/or patch your callers straight to you. We make paying for our serves as easy as we can. You can pay by check, bank transfer, PayPal, Visa or MasterCard. Sign up for our brochure! And don’t forget, you can always give us a call for help!